Time for a magazine update and a couple of articles from me, plus lots of lovely articles from lots of other folks too of course! I’ve got a Cut Out and Keep with some yum dies from La-La Land Crafts, you can find them over at Crafts U Love too, and my own pastel papers called a Medley of Pastels which you can find in my Etsy shop. Yeah, I think I need to work on my paper names! 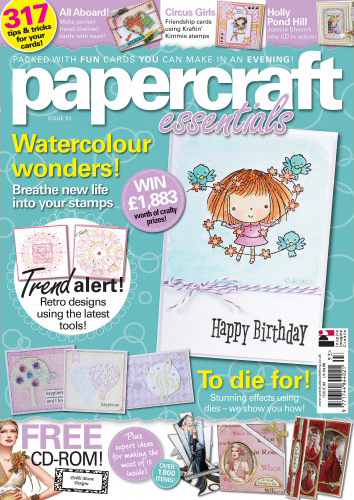 I’ve got a watercolour backgrounds article in this issue using Faber-Castell Design Memory Craft Gelatos and Stamper’s Big Brush pens, well not just backgrounds actually, I’ve made the embellishments with the Gelatos and Stamper’s Big Brush too. 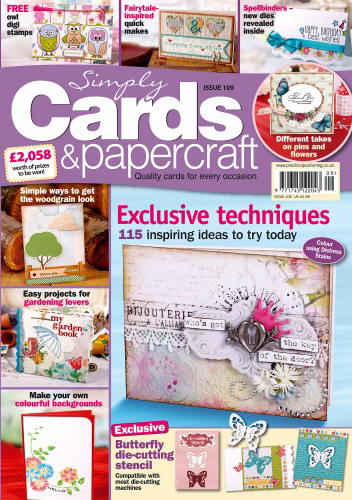 You also get a lovely butterfly die with this issue – pretty! Hey guys, I have my last DT make for La-La Land Crafts for you and this week the theme is Paper Piecing. Ooo Paper Piecing, that is always a fun technique to play with! 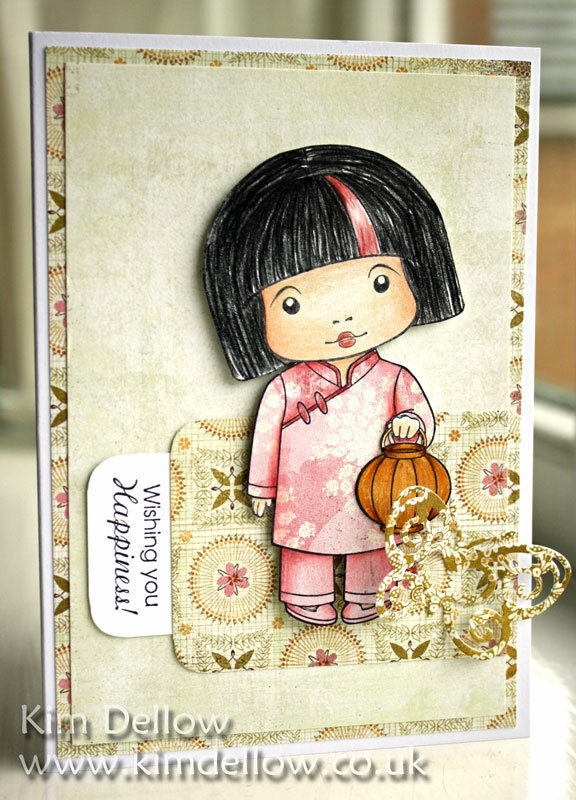 I’ve used the lovely Marci with Lantern and the sentiment she comes with for this one. Kept the card quite simple just added a bit of pencil colour to the paper piecing to add shade and dimension and used the Butterfly La-La Land Crafts Die for a simple embellishment. So, as I said this is my last make as a La-La Land Crafts DT member. I’ve really enjoyed sharing these cute stamps and dies with you guys over the last two years, it has been great working with all the La-La Land Crafts team. But I’ve decided to step down as I find myself getting quite busy with other projects! I’m going to miss working with La-La Lands Crafts but you guys don’t need to miss out on any of their news. If you want to keep up with everything La-La Land Crafts then don’t forget to check out the La-La Land Crafts Blog and the La-La Land Crafts Facebook page, for all the new releases and La-La Land Crafts news. They also have a Group page on Facebook as well as a Twitter feed. Enjoy your Monday. I wonder what I’ll post next Monday? It’s La-La Land Crafts Inspiration Monday time and this week we are making thank you cards. My thank you card is probably one for a friend I would think? A friend who likes pink perhaps! It’s Telephone Marci, who is probably one of my favourite of the La-La Land Crafts images this year. Although saying that there are quite a few favourites on my list from this year’s releases! I’ve used her with the La-La Land Crafts Butterfly die, but rather than popping the central cut heart out of the die, I kept it in place for a different look. There are more makes from the DT using the theme today and on Friday on the blog and you can link up your own La-La Land Crafts makes to the Customer Gallery for a chance to win. Also don’t forget to check out the La-La Land Crafts Facebook page, Group page and Twitter feed. 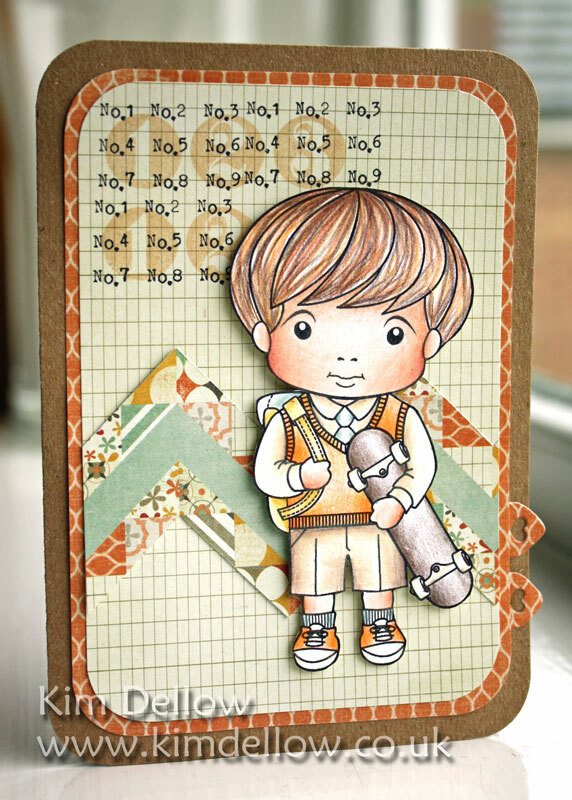 How about a little numerical inspiration from La-La Land Crafts this Monday? 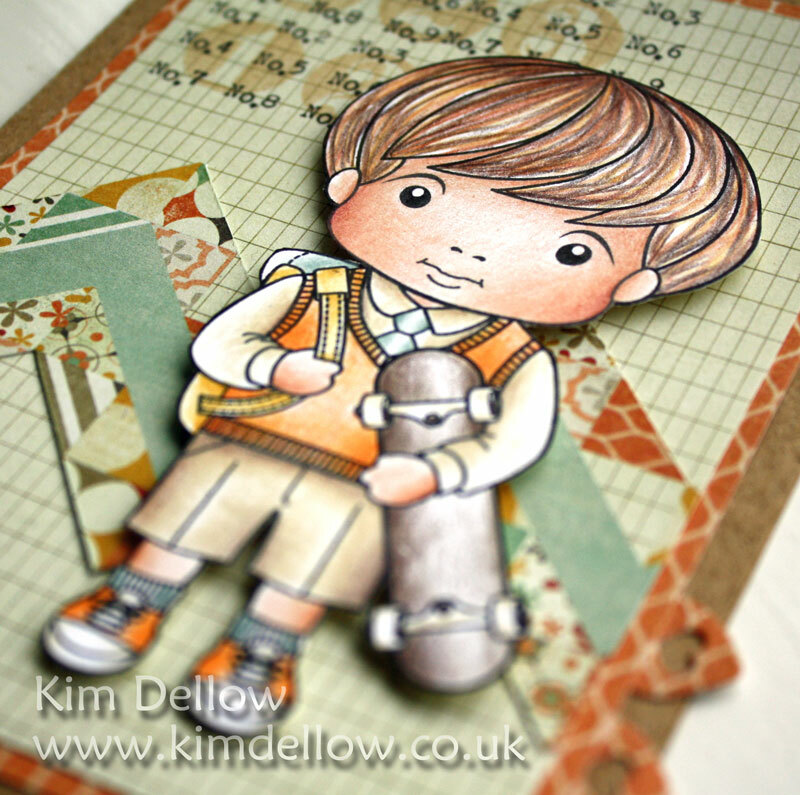 So this week’s La-La Land Crafts Inspiration is to add a number to your make and I’ve gone for a bit of layered stamping on the background of my card with Back to School Luka. You can tell I’m still in a very Autumnal mood can’t you? I’ve used the La-La Land Crafts die – Heart Fence to add little tags. I think that Autumn might be here. Well, I say Autumn but really as soon as the heating goes on I think we are in Winter – and yep we have now got our heating on! With all the Christmas makes I’ve been posting on my blog I do feel that I’ve just jumped straight through Autumn into Winter so my post today is a nice drop back into Autumn again and seeing as whilst I am writing this it is a gloriously sunny November Monday, it seems like the perfect post for today. 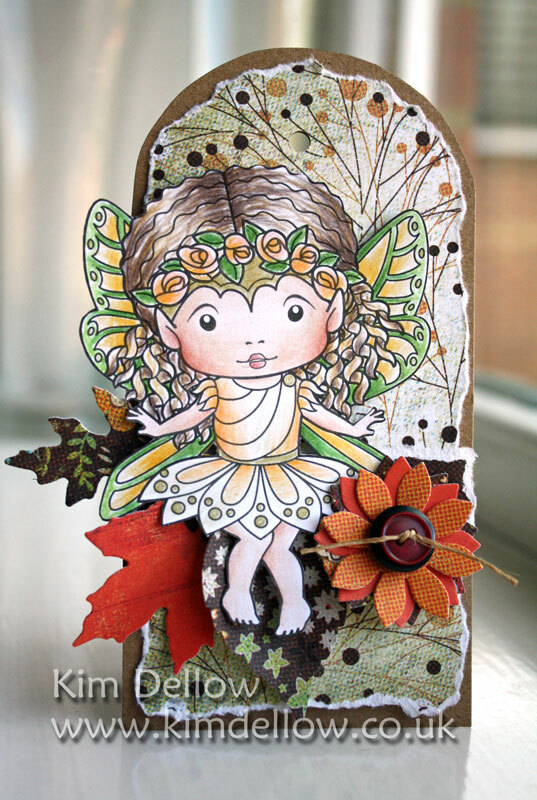 It’s for the La-La Land Crafts Inspiration theme this week which is Autumn Colours and I’ve used Rose Faerie Marci to be my Autumn Rose with the Lotus Die to make the button flower. 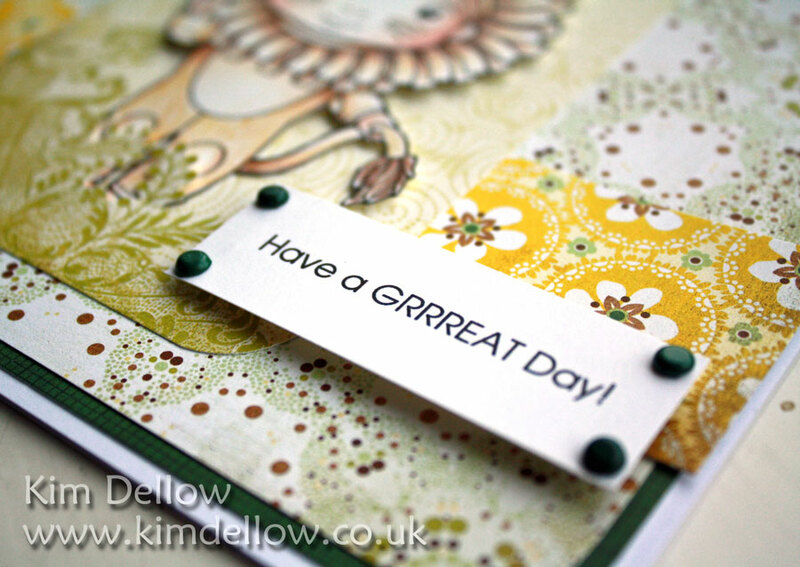 As always there is more inspiration for this theme over at the La-La Land Crafts blog today and on Friday. Have a fun Autumnal Monday. Hey up Monday Hoppers, it’s La-La Land Crafts Inspiration Monday time again. 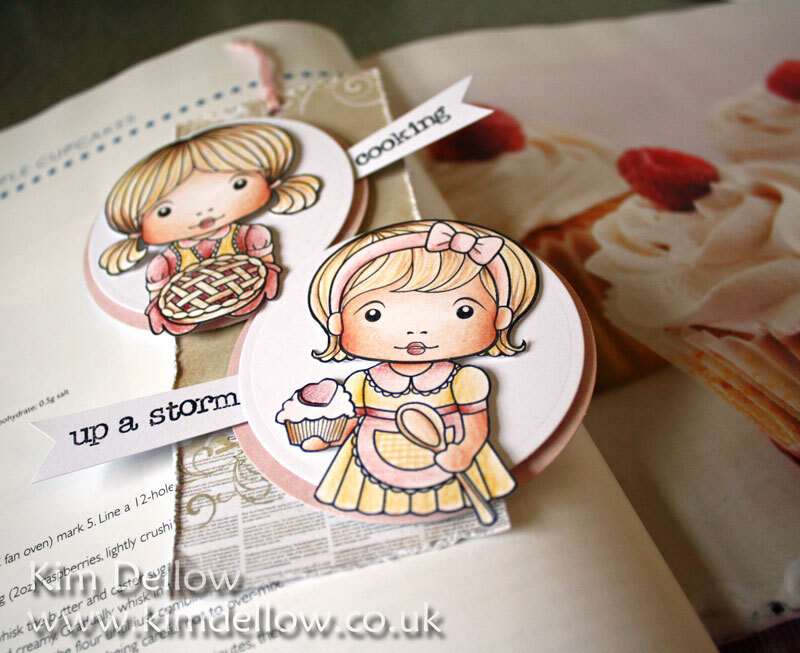 This week the inspiration is to use two images from the La-La Land Crafts family and I thought I would go with a baking theme and made a very quick little bookmark for cooking fans! Baking Marci and Sugar n’ Spice Marci are cooking up a storm! Only problem now is that I’m feeling a bit peckish for a cupcake or a pie – not sure why?! Don’t forget to check out the La-La Land Crafts blog today and on Friday to see more Double images. Hey, Hey, Hey! 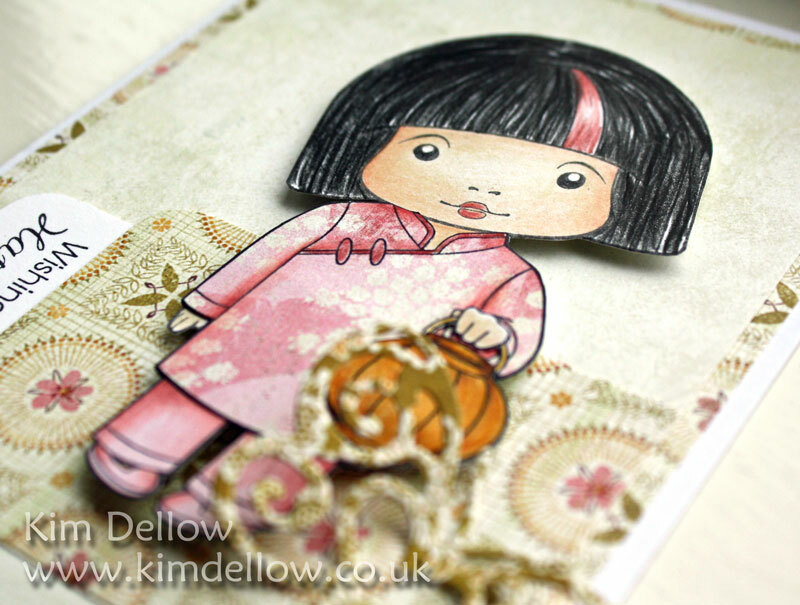 We have another La-La Land Crafts Inspiration Monday and this week the inspiration is…Ooooo….Halloween. Yeah, I’ve been having a bit of fun with the run up to Halloween here on my blog but how about something a bit more starry? It is Flying Witch Marci again, you saw her here in green a few weeks ago when she was released. I’ve used her with the Creepy Vines die this time. 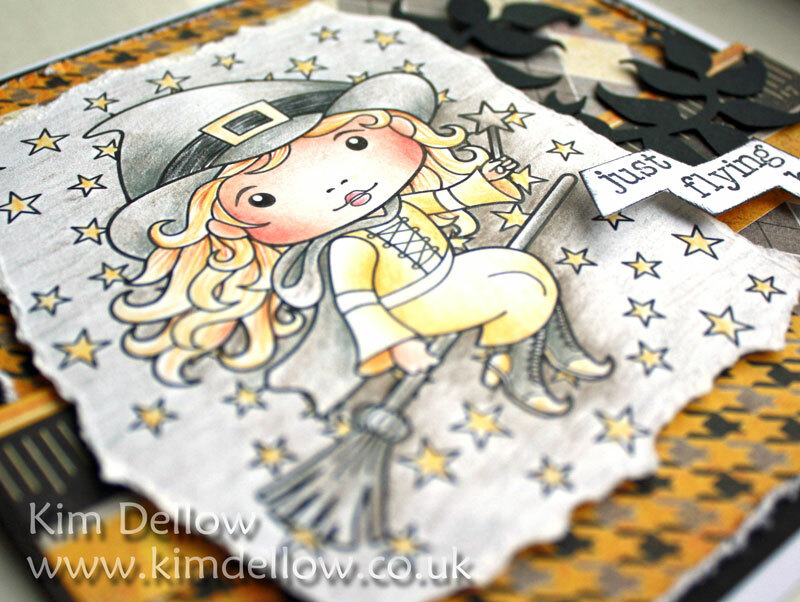 The stars come with Flying Witch Marci and you can use a bit of mask stamping to make the starry background. As always there is more inspiration on the La-La Land Crafts blog today and on Friday and you can link up your makes to the Customer Gallery too and perhaps win something cute too! Yeah, I am looking forward to Halloween, you can tell can’t you? It is an excuse to eat lots of sweets and have a Harry Potter film marathon in our household. Do you do anything? Are you ready for this week’s La-La Land Crafts Inspiration Monday? It is a special one as it is a mini-release day too. So let me introduce you to Angel Luka with Horn! 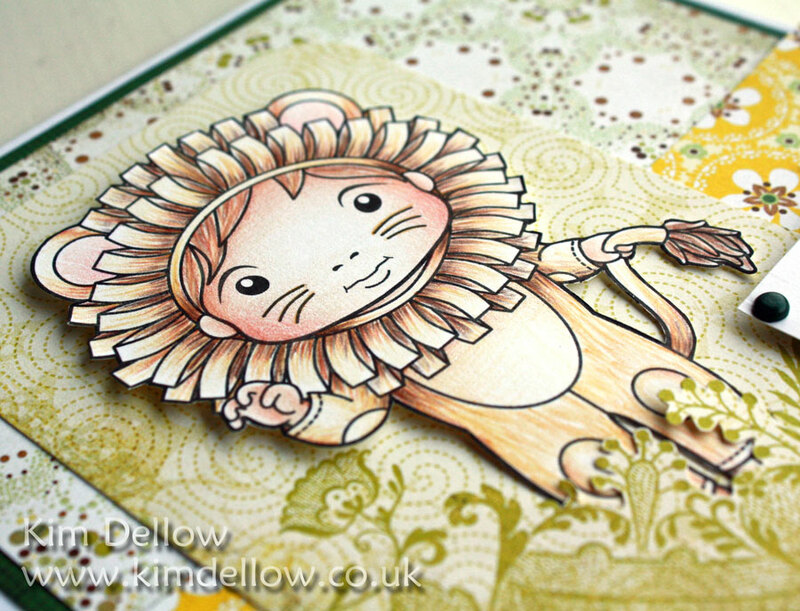 The inspiration is a fabulous sketch so pop on over to the La-La Land Crafts blog to see all the release and the sketch too. I’ve also used the Filigree Corner die and one of the Butterfly dies too. Of course don’t forget there is more inspiration on the La-La Land Crafts blog today and on Friday and you can link up your makes to the Customer Gallery too and perhaps win something cute too! Hope you like all the new stamps! Happy Monday everyone! You guessed it! 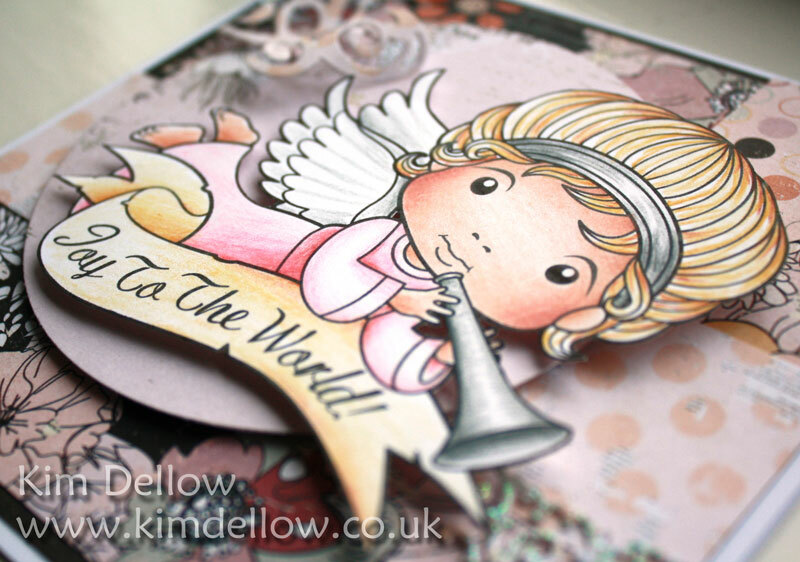 It is another La-La Land Crafts Inspiration Monday and this week the inspiration is…Christmas. Yep, it is all Christmas and Halloween on my blog at the moment! 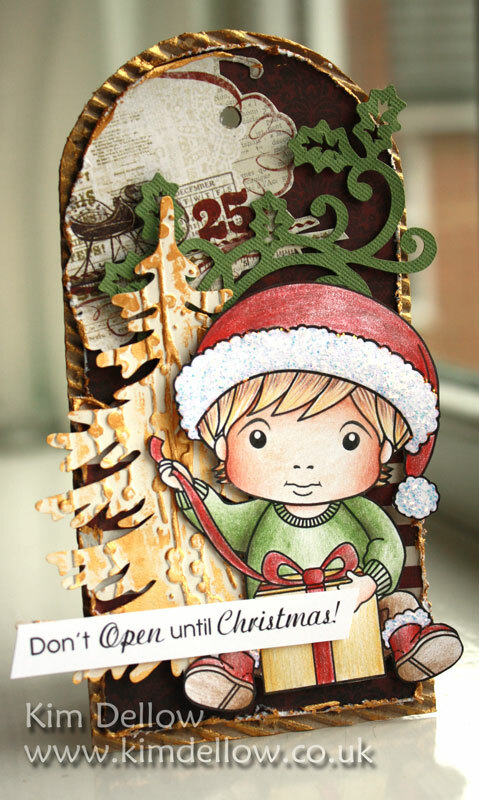 So another Christmas make for you and this one is a tag with cute little Christmas Present Luka. 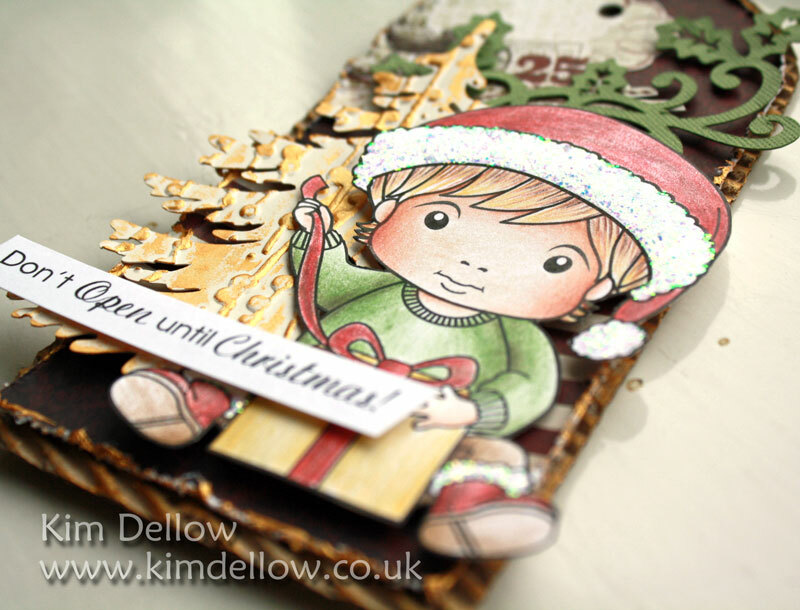 I’ve layered him up on the fabulous Christmas Tree die and the Holly Flourish Die. I’ve added some touches of gold acrylic paint here and there too. 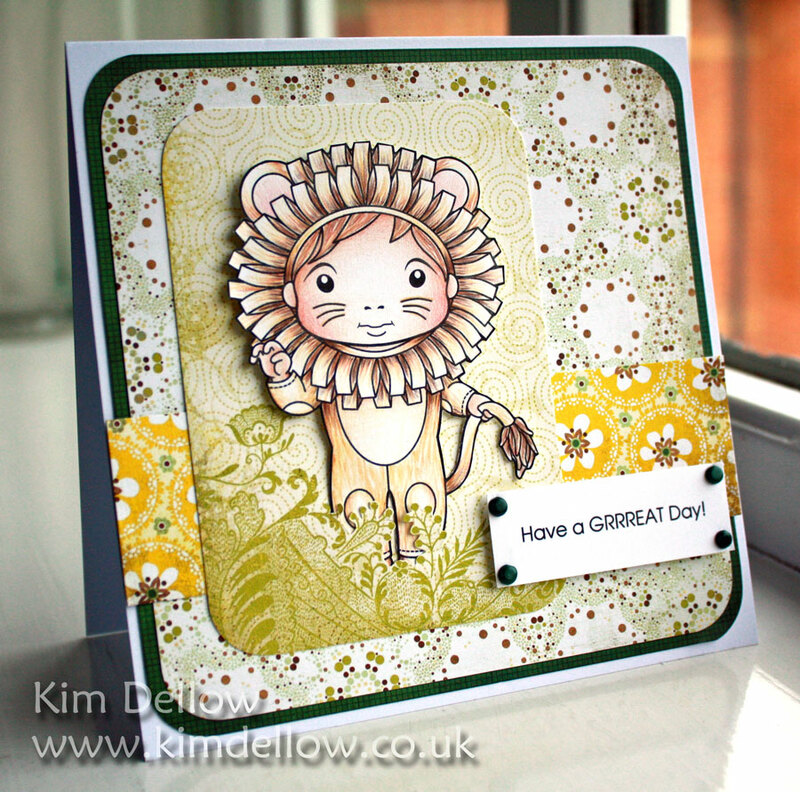 Change of pace again from me today after the mixed media CAS tag from the weekend. Today is La-La Land Crafts Inspiration Monday and this week the theme is adding metal embellishments. I’ve used cute Lion Luka for this simple little birthday card. He comes with a couple of sentiments too. The brads are my metal embellishment. For more metal ideas pop on over to the La-La Land Crafts blog today and on Friday. How do you fancy a La-La Land Crafts Christmas tag? You do? Great! You’ve got it! 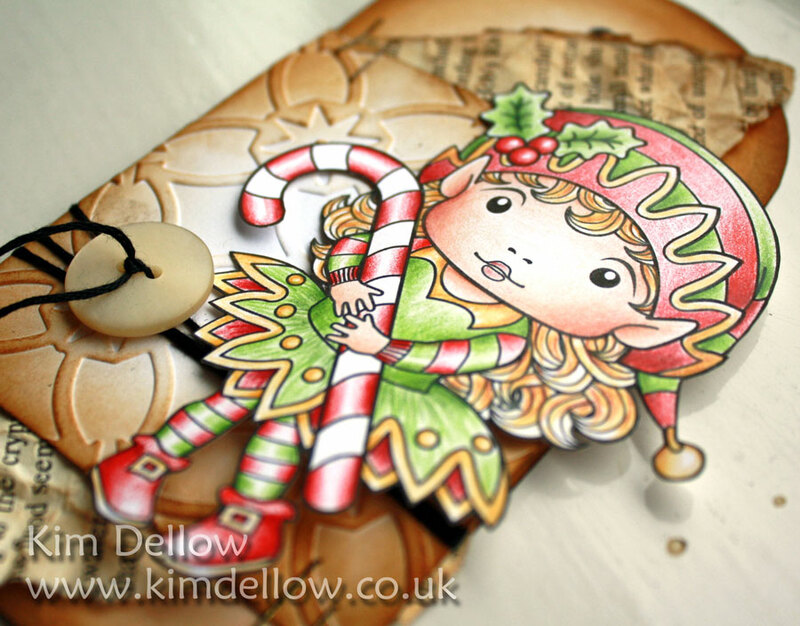 It’s La-La Land Crafts Inspiration Monday and this week the inspiration is Lace and Pearls and I’ve used one of the cute new releases – Christmas Elf Marci – to make a quick, slightly grungy Christmas tag. She comes with sentiments as well so go check them out. The lace? Well my interpretation is the embossed lace matrix pattern behind her. The pearl? The button of course! 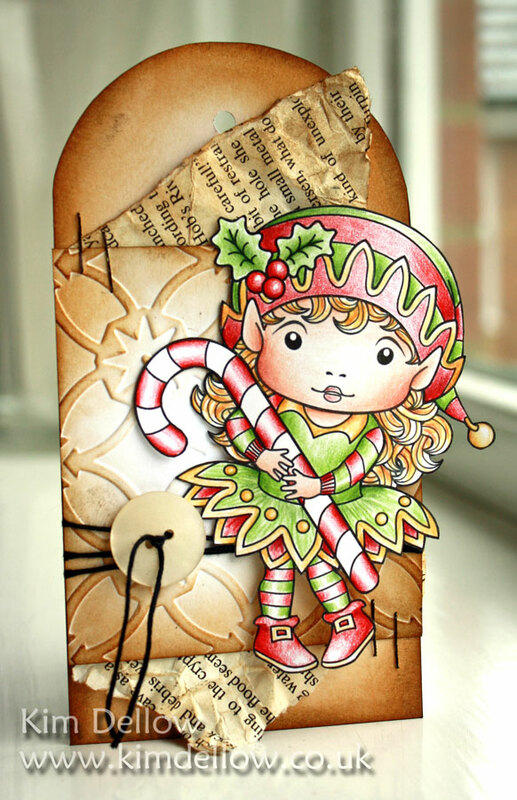 Wouldn’t she look just perfect with the La-La Land Crafts Holly Flourish die behind her? Yes, I think so too, and that was my intention but it was only as I was sitting here processing the photo that I released that I had forgotten to put the die cut on. D’oh! Right better go check what else I’ve forgotten to do today! Don’t you forget to go check out the La-La Land Crafts blog today and Friday to see more lace and pearly makes.